I bought this a year ago for ten dollars at a lein sale. Interior work underway.we get to build whatever we can imagine. I love working on this boat. Our stateroom, it was the fish hold. A new computer and haven't down loaded pictures yet but I will do so soon. Our main focus since Christmas has been interior work. 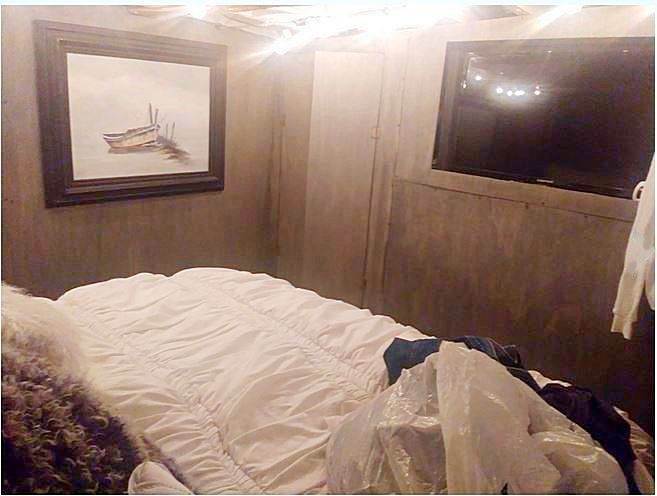 I built the master stateroom in what used to be the fish hold, what a task that was, ever try to build a square room in a round boat. The electrical is getting close to complete, installed a new Raritan macerator head and Electro Scan MSD. I am ready to start adding 24' to the pilot house and add the galley and salon. Big plans and little time. I retired last year but was called back 3 months ago, It's great money but uses up a lot of time, I'm on the road Flight testing about 15 days a month. It means a great deal to us to save this Grand Vessel. To have your input as a previous owner and to realize the work you put into her is heart warming. Merry Chrisrmas Bryan and family. Your effort and hard work are on full display!! 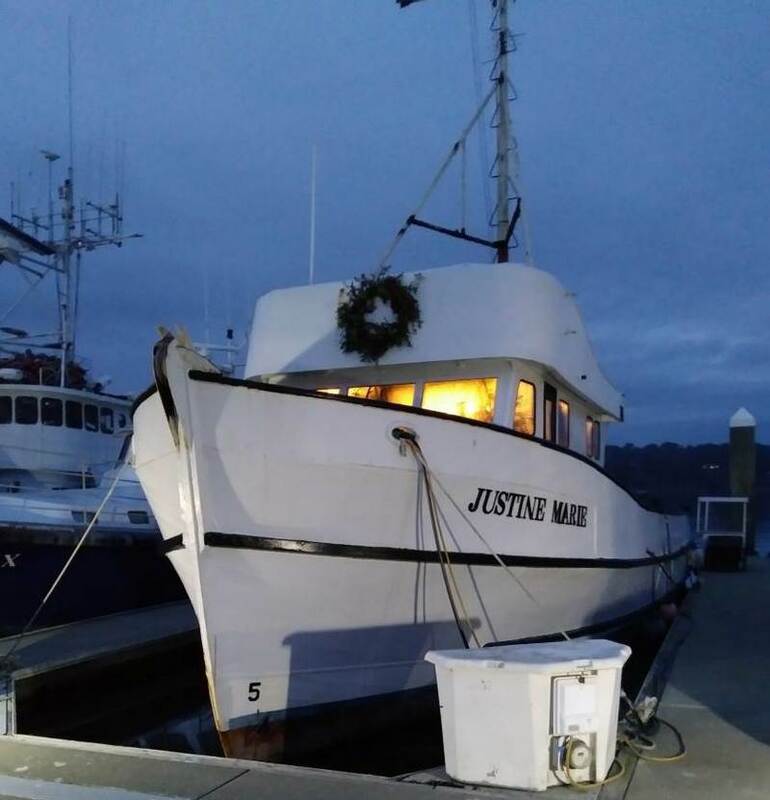 Congratulations on your beautiful boat and thanks for the wonderful Christmas card . 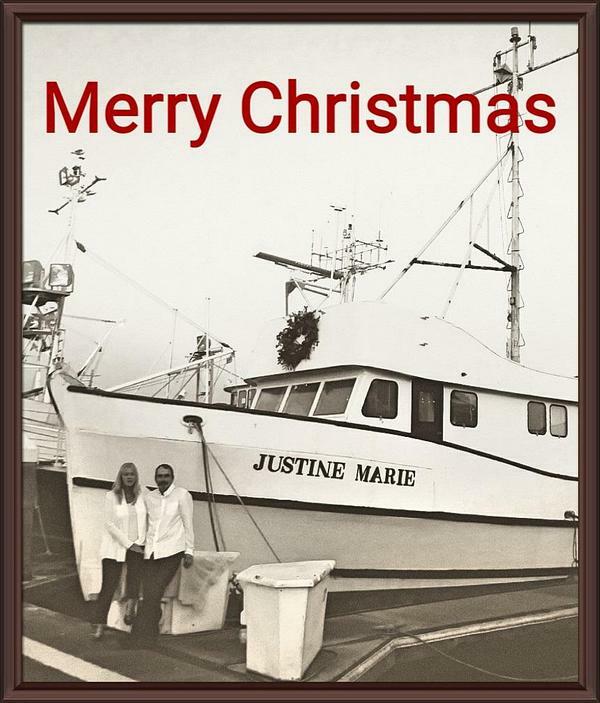 And a Merry Christmas to you, Justine Marie and all who sail in her. My parents bought this Navy Mine Sweeper in Long Beach and towed it up the coast and rebuilt it at Pete's Harbor in Red Wood City, as an Albacore and Crab Boat. The original Engines were non-ferrous Packard diesels that were later replaced with the Jimmy's. This boat (TAKU) was my first home in 1975. I am sure that my Dad would love to share the history of the early days of the boat with you. 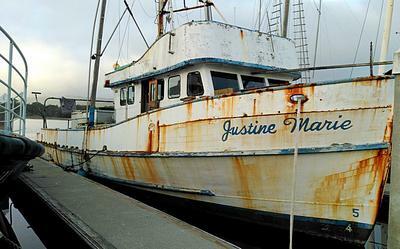 Wow, it's great to hear from the guy that owned and operated this boat for years. He knows every inch of Justine Marie, his family has a long history with this boat, I hope I can live up to the standard and be as good steward that his family has been. James you are most welcome to come see her at any time. If you really want to know about that boat, like every bit of history, email me. I used to own it, but lost it due to family feud. She is the last remaining navy minesweeping boat, #msb 33. She is double planned mahogany, with 3" of fiberglass overlay just past the water line. Right engine was just rebuilt before the fued, and boat got in the condition you found it. I am so glad someone got her, instead of getting destroyed. There is more history to her than you know. Well I took a 4 day weekend and got a lot of interior work done. Built stairs instead of ladders built 2 bunks for the Grand kids, added some storage space and an overall cleaning and organizing. I need more time off from work, but need the cash flow. 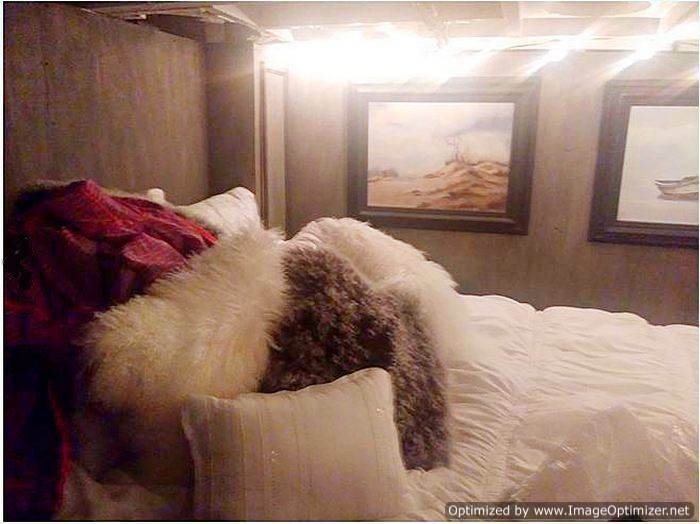 Well another week of rain out here in sunny California, sure hampers my planned work schedule, so I'm inside replacing flooring all week and building a couple bunks for my grand kids who love coming to Papa's Boat. Nothing more enjoyable than scraping up asbestos tile and sanding lead based paint, about to wear out my vacuum system. But I love seeing the progress every week. I still work a full time job so it can be slow at times. I Love this Boat, you gotta get one. We get a lot of good comments from the fisherman around us who watched this boat deteriorate after the owner passed away, it's inspiring to us and drives us to continue the work. The marina is getting a bit sketchy wanting to take it to the bay area for a bottom job, but I'm not going until I know she's ready. It must be rewarding to at least get to the place where you can live on her and not see any rust. I hope all the systems repairs work out as nicely. We are now living on her full time to free up some cash for engines and electrical. she's a sound boat and is really coming together. So far we have spent about 3 grand in materials, Labor?, crap it's just me and my wife, we haven't paid anyone but an engine guy for an inspection, $200. Great job!! But you still gotta chage the name to rusty justy lol. Hope you like sand paper. 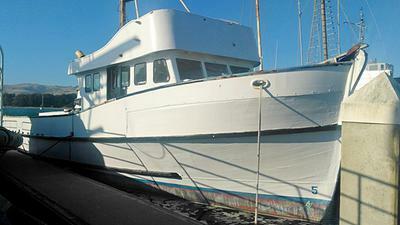 I just purchased this 60' trawler built by Peterson boat works in 1953. She has been sitting for 6 or 8 years. I got her for $10.00 dollars at a lean sale. Where do I start so I can determine if its a viable project or a scrap job. Well I've had her a year now and completed a lot of work (except engine room). I figured out the hull is wrapped in fiberglass which makes the bottom very water tight, been doing a bunch of deck repairs to keep her dry inside. I am ready to start the right main in a week or so. Have to replace the helm pump and wheel, as the scavengers took it the week I got her. 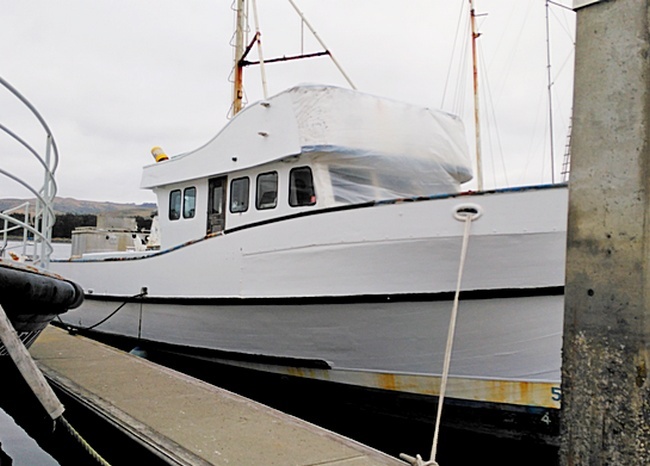 Several gallons of paint and a million hours of sanding she look like a new boat. We have been re modeling the interior for a cruiser configuration. I'll post some pics when I can download them. Have fun, enjoy, its a wonderfull adventure. I have a 40 ft wooden fishing troller myself, started out thinking "my god what have I done", got to know the boat and restoring is fantastic fun. Do you have a picture of the transom with the name? I have a god daughter named Justine Marie. Just by looking her I see she is siting high out of the water. But you could be leaking in to the bilge for all I know but she looks pretty good from here. I just I'm really in to older boats I just love them, if you start this job be good to her. And pull her out of the water see what's going on. Thanks sir for showing her off, $10.00 Bucks lucky guy. Nice to see a picture. Look for rot, thats a start. It looks like it needs bottem paint. 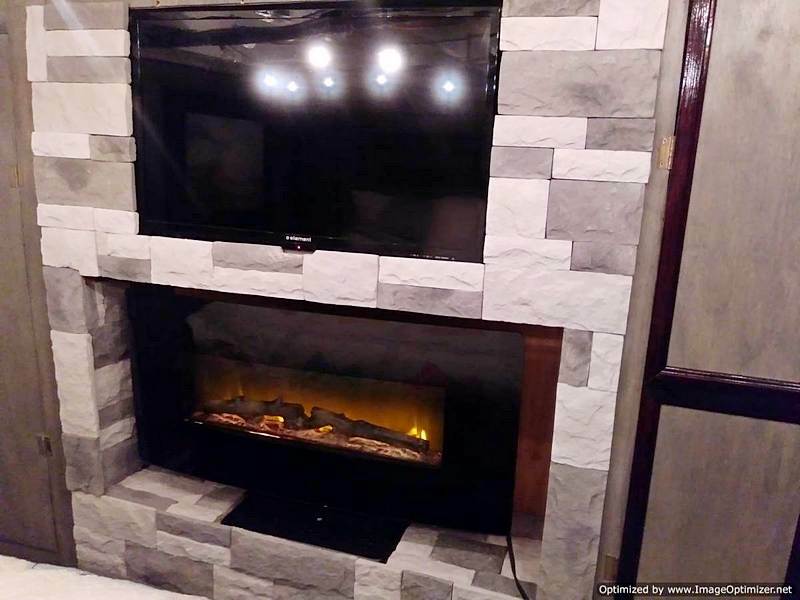 Take it out of the water, price a survey, if it's sound then go for it. A0 lot of boat Justine, put up a few pictures. Fee comes by a lot lately its the cost of storage and time. If its a wood boat my friend, just had his hull refashioned, two new planks, re plugged and painted to the water line. This cost him twenty grand, he paid 3500 for the boat and offered it two me for two thousand. It became a summer cabin, even though I love wood boats this one's too big.